I expect every town, every city, every village, maybe every street has a part that is breathtakingly wonderful but un-noticed and neglected. It’s a grey day and these are grey walls. The ground is wet, the gutters are gungy and water is caught between stems in the wall. I suspect it's a garden escapee. I don't know what this is either. 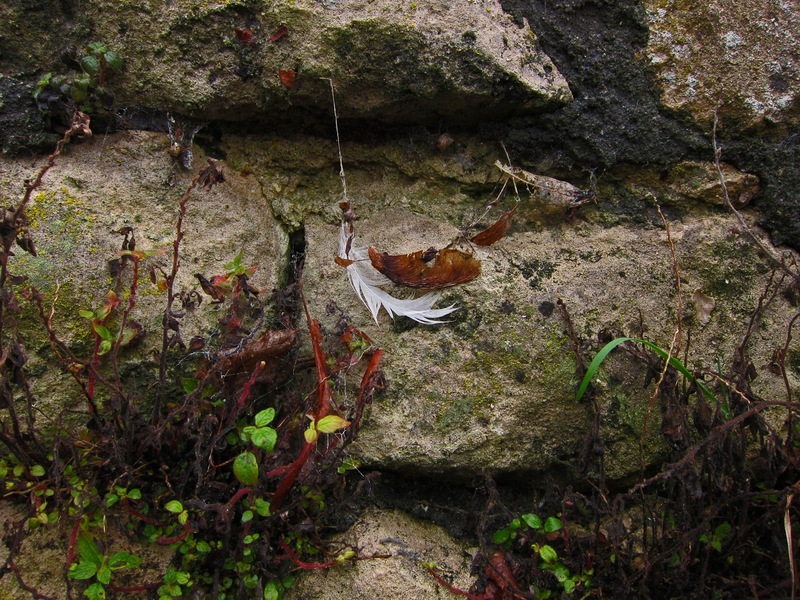 and a feather and sycamore seed caught on the Wall. High on the wall, then . 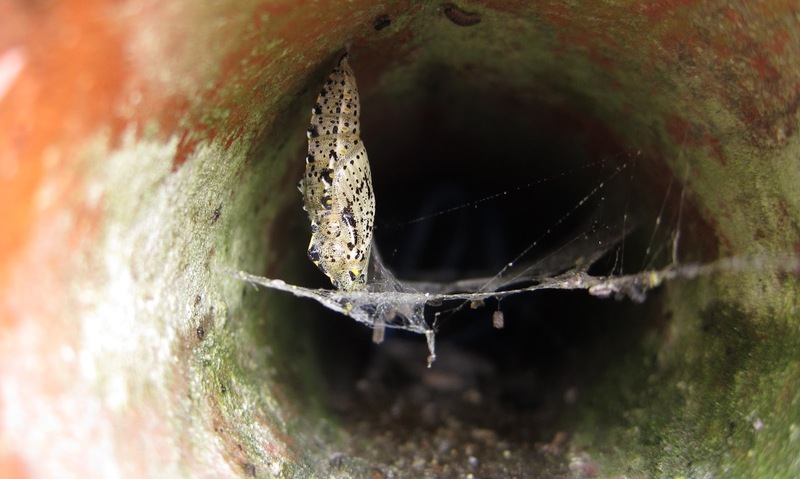 . .
safe and surprisingly dry, inside the wall - the chrysalis of a Large White butterfly. This area is close to town but neglected. It’s a steep walk. People are likely to look down as they go up. When they come down, the natural thing is to look at the view the - harbour, the bridge the buildings and masts, roofs, roads - and the hills beyond. The walls loom. Plants make their home there. well-spotted Lucy with the speckled chrysalis. A lovely capture and a nice take too on wall plants. Really nice photos! Thanks for the little tour. I agree, there are always things around us that most don't notice. All we have to do is LOOK for them and be open to them. I didn't know there really was a plant called Wallflower until my one trip to England and there they were! Enchantingly growing everywhere on the walls in spring. 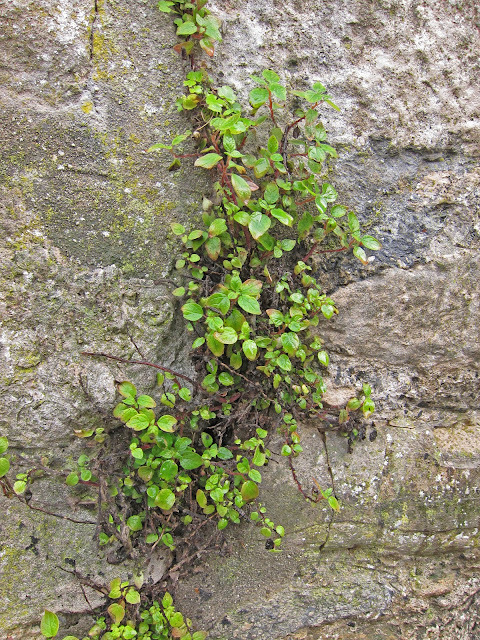 They can't keep going here in our climate, but it made me aware that sometimes plants can get their toes in and grow on and in walls. I have tried getting them started in this garden on/in little dry-laid stone walls, but they dry out too quickly and I'm not up to standing out there everyday with a garden hose to keep them alive. I guess what I'm trying to say is: When we discover something like you did, how really special and amazing it is. Your climate is much more forgiving for those tenacious little ones. Lovely! Hello - Just passing....! I think the second pic might be of Shasta Daisy. Fabulously tall and vigorous plant, which has large daisy flower. Good ground cover if left to its own devices. Enjoy! 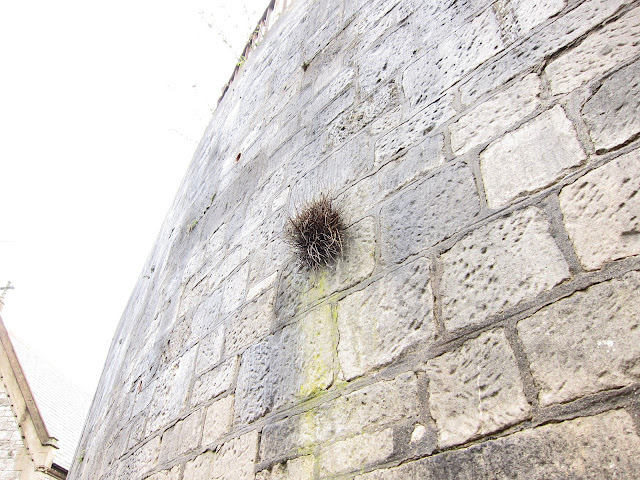 Ooops - if it's growing on the wall it will make an interesting specimen! There was a time when a town's public gardens were a source of pride and community spirit... These days public places are so often dirty, down-at-heel and drab. Hmmm tell me about it. My neighbour gave me an old postcard of our town park. Somewhat municipal/Victorian style bedding in bright colours. Today there is - lawn - trees - benches - and drinking and the residue of plastic garbage. At least out of drinking hours it is a green and open space. Hello Patio Patch. I was lucky with the chrysalis - I could reach up and look into the pipe it is in (some are too high) and that my camera could see it better than me. Hello Pat. I hardly ever walk this way and was pleased to see how much is there. I took more photos but dull light made them boring. Hello Bella Bheag. I hope I will be able to find this second plant again so I can see what happens as it grows. There's masses of the first kind. Hello Mark and Barbee. I'm not sure what is happening with the park area. It is not large and is on quite a complex terrain for such a small area (several levels). It was untended for a long time - then it seemed as if it was being turned into a kind of community gardens. Then there were the drinkers. Now it's more or less bare earth. The location is odd. Not only are there lots of walls near it, it's held against the hill by another very high and very long wall. In one place this is shored up with huge beams. Maybe the whole park is in danger of sliding down behind the council offices. Hello Jack. The buildings in view aren't exactly beautiful but I think the walls are wonderful. The area at the top of the hill is very run down. 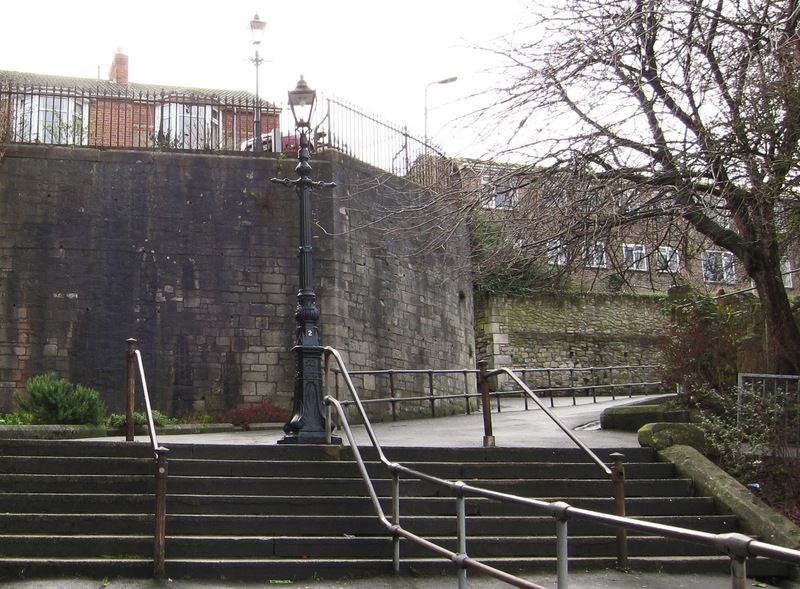 If it weren't, I think the path between the walls could become quite a feature of the town. Your eye for beauty highlighted some amazing views. Love this post. Just read your comment regarding my little red caterpillar. Very interesting thought and the best solution I've received. Thank you! I love plants growing on cliffs, in road cracks, and especially in stone walls. Lovely photographs! Wish I could help you identify the plants- I'm not sure. Your pictures are great though! I especially love the first one. You can tell that it was breathtaking once (and still has great potential). I love the way plants always find crazy places to make a home for themselves, even when we humans forget that parks are supposed to be beautiful life-enhancing places not wastelands, and don't plant them to look wonderful wherever they are, whatever size. It's amazing what you can find in the most unpromising places isn't it? I've followed your link to the petition about our woodlands and signed the petition. There's a fantastic wall in our town that I must try and go and see as all summer it is full of wild flowers - mostly yellow ones but the name has left me just now. I'm having a senior moment. Yeah another person on NBN that I know! Not sure if you know that 'm part of the team over there. I'll give you the heads up when I am going to introduce Loose and Leafy to the NBN community. Normally I blog on the NBN blog on a Wednesday welcoming all the new members but your blog database isn't just quite ready - it takes a little while to get that techy side of things sorted. Would you like your blog placed on our map Lucy? - if you do send me a comment on one of my own blogs and I'll get that sorted rather than going through the email system as you might be wondering how I came by your email to NBN if you don't read this first. Hello Carolyn, I don't suppose there's any way now of knowing whether the red caterpillar solution is the right one. However, it will be interesting to see if you find more like it. Glad you like the plants in the wall post. Hello Fer. I think this is a path that many tread daily so they get used to it and it doesn't seem special. Others have no reason to go there so it doesn't get noticed. Eliza - the world of a wall seems strangely at odds with things which grow on the ground, even when both habitats are shared by the same or similar plants. Hello Darla. Glad you found the Wall post of interest. Hello Jenn. I am not familiar with France but this little patch of town reminds me of pictures I have seen of more-wall dominated cities there. Hello Plantalicious. I think there were great hopes for the little park nearby. All the old bushes were uprooted and ground clearer . . . then it all came to a halt. I suspect the land turned out to be unsafe, being close to a drop - but I don't know. Hello Rowan. Glad you signed the petition asking the government not to sell of woods and forests. There has been a big reaction against the idea but that doesn't necessarily mean the government will drop it. Karen (http://wildelycreative.wordpress.com/ ) and hen (http://www.heartandsoil.blogspot.com/) are going to Parliament tomorrow as part of the lobbying. (Tomorrow being 2nd February 2011). If you are on Twitter - I expect they will be keeping people in touch with how they get on through the day. sometimes the different regions mirror each other's climates, then they slide out of synch again. Hello Leavesnbloom. Blogger is set to email comments as they arrive but seems to have got erratic and not all are being sent through so I've just read your note here. It was only when I was filling in the details for the Nature Blog Network that I realised you are part of the team. I had heard of it before but never got round to looking into it. It must take a lot of your time - it's bigger than I expected. Yes please. It would be good to be on the map. I'll drop over to your blog to let you know there too. I really liked your photos. It is so amazing and great indeed. Nature is always be the best subject in photography.